Researchers at Princeton University are using synthetic diamonds to preserve fragile quantum information over long distances. Photo: Frank Wojciechowski for Princeton University. Diamonds are prized for their purity, but their flaws might hold the key to a new type of highly secure communications. Researchers at Princeton University are using diamonds to help create a communication network that relies on a property of subatomic particles known as their quantum state. Researchers believe such quantum information networks would be extremely secure and could also allow new quantum computers to work together to complete problems that are currently unsolvable. But scientists currently designing these networks face several challenges, including how to preserve fragile quantum information over long distances. Now, the Princeton researchers have arrived at a possible solution using synthetic diamonds. In a paper in Science, the researchers describe how they were able to store and transmit bits of quantum information, known as qubits, using a diamond in which they had replaced two carbon atoms with one silicon atom. In standard communications networks, devices called repeaters briefly store and re-transmit signals to allow them to travel greater distances. Nathalie de Leon, an assistant professor of electrical engineering at Princeton University and the lead researcher, said that diamonds could serve as quantum repeaters for networks based on qubits. The idea of a quantum repeater has been around for a long time, "but nobody knew how to build them," de Leon said. "We were trying to find something that would act as the main component of a quantum repeater." The key challenge in creating quantum repeaters has been finding a material that could both store and transmit qubits. So far, the best way to transmit qubits is to encode them in particles of light, called photons. The optical fibers currently used across much of the communication network already transmit information via photons. However, qubits in an optical fiber can travel only short distances before their special quantum properties are lost and the information is scrambled. It is difficult to trap and store a photon, which by definition moves at the speed of light. Instead, researchers have looked to solids such as crystals to provide the storage. In a crystal such as a diamond, qubits could theoretically be transferred from photons to electrons, which are easier to store. The key place to carry out such a transfer would be flaws within the diamond, locations where elements other than carbon are trapped in the diamond's carbon lattice. Jewelers have known for centuries that impurities in diamonds produce different colors. To de Leon's team, these color centers, as the impurities are called, represent an opportunity to manipulate light and create a quantum repeater. Previous researchers first tried using defects called nitrogen vacancies – where a nitrogen atom takes the place of one of the carbon atoms – but found that although these defects store information, they don't have the correct optical properties. Others then decided to look at silicon vacancies – the substitution of a carbon atom with a silicon atom. But silicon vacancies, while they could transfer the information to photons, lacked long coherence times. "We asked, 'What do we know about what causes the limitations of these two color centers? '," de Leon said. "Can we just design something else from scratch, something that addresses all these problems?" 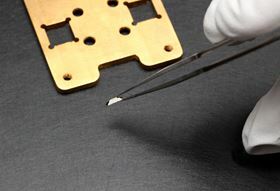 The Princeton-led team and their collaborators decided to experiment with the electrical charge of the defect. Silicon vacancies in theory should be electrically neutral, but it turns out that other nearby impurities can contribute electrical charges to the defect. The team thought there might be a connection between the charge state and the ability to keep electron spins in the proper orientation to store qubits. The researchers partnered with Element Six, an industrial diamond manufacturing company, to construct electrically neutral silicon vacancies. Element Six started by laying down layers of carbon atoms to form the crystal. During the process, they added boron atoms, which have the effect of crowding out other impurities that could spoil the neutral charge. "We have to do this delicate dance of charge compensation between things that can add charges or take away charges," said de Leon. "We control the distribution of charge from the background defects in the diamonds, and that allows us to control the charge state of the defects that we care about." Next, the researchers implanted silicon ions into the diamond, and then heated the diamonds to high temperatures to remove other impurities that could also donate charges. Through several iterations of materials engineering, plus analyses performed in collaboration with scientists at the Gemological Institute of America, the team produced neutral silicon vacancies in diamonds. The neutral silicon vacancy turned out to be good at both transmitting quantum information using photons and storing quantum information using electrons, which are key ingredients in creating the essential quantum property known as entanglement. This describes how pairs of particles stay correlated even if they become separated. Entanglement is the key to quantum information's security: recipients can compare measurements of their entangled pair to see if an eavesdropper has corrupted one of the messages. The next step in the research is to build an interface between the neutral silicon vacancy and the photonic circuits to bring the photons from the network into and out of the color center. Ania Bleszynski Jayich, a physics professor at the University of California, Santa Barbara, said the researchers had successfully met a longstanding challenge of finding a diamond flaw with characteristics favorable to working with quantum properties of both photons and electrons. "The success of the authors' materials-engineering approach to identifying promising solid-state defect-based quantum platforms highlights the versatility of solid-state defects and is likely to inspire a more comprehensive and extensive search across a larger cross-section of material and defect candidates," said Jayich, who was not involved in the research. This story is adapted from material from Princeton University, with editorial changes made by Materials Today. The views expressed in this article do not necessarily represent those of Elsevier. Link to original source. Scientists have succeeded in coupling together the specific defects in two separate diamonds, which could lead to novel quantum technology. Defect centers in diamond are now being used as sensitive quantum probes for a variety of applications. Using an an atomic-scale 'color center' found only in diamonds, scientists have become the first to image how electrons move in graphene.